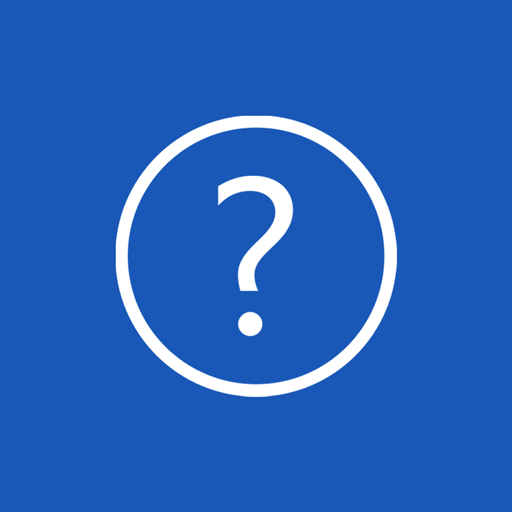 What are the differences between free and paid version? The paid version offers additional blocks which require write settings permission. The new method HaveSystemWritePermission could be use to check, whether we have system write permission or not. Returns true or false. In case of false, the Android permissions menu of the app will be opened automatically. The new event NoSystemWritePermission can be used to display a message for the user to explain, why it is necesssary to have that permission, see also the screenshots of the example apps. The new method HaveNotificationPolicyAccess could be use to check, whether we have notification policy access or not. 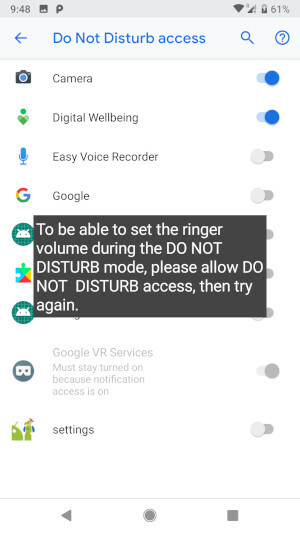 This is required 1) to be able to set the volume of the Ringtone for >= Android N during DO NOT DISTURB mode or 2) to toggle the Do Not Disturb mode.. Returns true or false. In case of false, the Android notification policy menu of the app will be opened automatically. The new event NoNotificationPolicyAccess can be used to display a message for the user to explain, why it is necesssary to have that permission, see also the screenshots of the example apps. The new method InterruptionFilter could be use to toggle the Do Not Disturb Mode. Get the brightness (a value between 0 and 255). Thank you Tsiantakis Apps for being the sponsor of the brightness properties! Get the brightness mode (MANUAL or AUTO). Thank you Conor for being the sponsor of the brightness mode properties! Returns whether User Interface shoud be shown while setting the volume. Specifies whether User Interface shoud be shown while setting the volume. Get alarm volume in percent. Thank you Merciful for being the sponsor of this property! Set alarm volume in percent. Get music volume in percent. Set music volume in percent. Get ring volume in percent. Note: to set Ringtone for >= Android N during DO NOT DISTURB mode: the permission ACCESS_NOTIFICATION_POLICY is required. Therefore the new method HaveNotificationPolicyAccess and the event NoNotificationPolicyAccess have been added into the paid version. 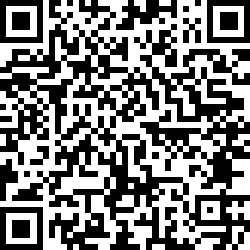 For the free version this property only works for devices below Android 9. Set ring volume in percent. Thank you Boban for being the sponsor of this property! Set the brightness mode (MANUAL or AUTO). 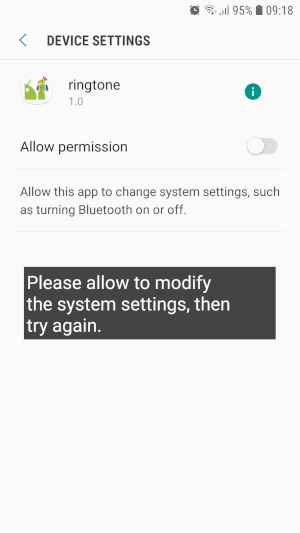 Note: you will have to build the app before being able to set the brightness mode, because the companion app does not offer the permission android.permission.WRITE_SETTINGS. Set the brightness (a value between 0 and 255). Note: to set the brightness is only possible in brightness mode MANUAL. You can't set the brightness manually and have adaptive brightness at the same time! Note: you will have to build the app before being able to set the brightness, because the companion app does not offer the permission android.permission.WRITE_SETTINGS. this snippet was used for this property. This is an experimental method! Probably you have to restart your device to show effect. Thank you BriFi for being the sponsor of this property! Get current ringtone. Type can be RINGTONE, NOTIFICATION or ALARM. Thank you James and chabooya for being the sponsors of this method. Note: as Triratna found out here: after setting another ringtone outside of the app (for example in the default ringtone app), the extension does not refresh and still will display the previously set ringtone. 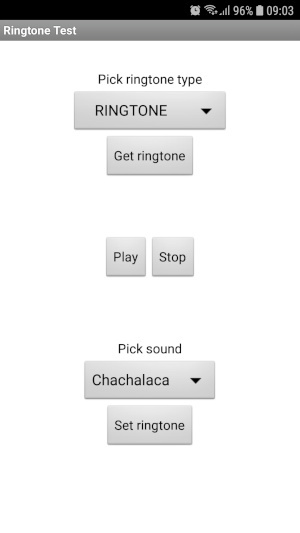 As workaround, restart your app to get the correct ringtone. Play ringtone. Type can be RINGTONE, NOTIFICATION or ALARM. Check, whether we have system write permission or not. Returns true or false. 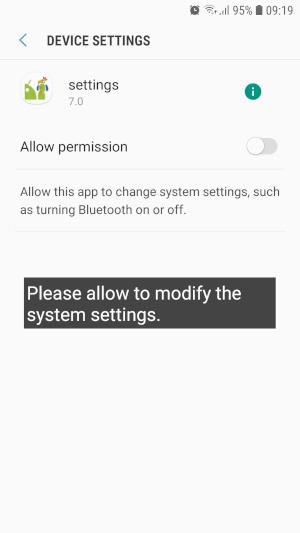 In case of false, the Android permissions menu of the app will be opened automatically. 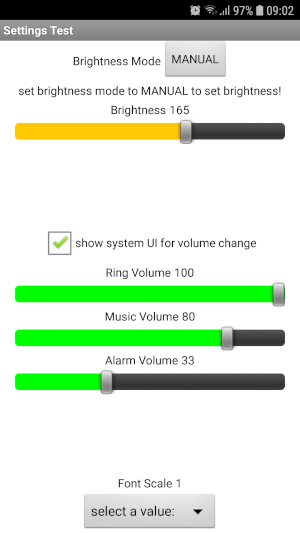 Set sound file as ringtone, notification and/or alarm sound. Title is a custom name for the sound. Type can be RINGTONE, NOTIFICATION or ALARM. The sound file must be stored on the internal sdcard and in mp3 format. For files from the assets, copy them first to the internal sdcard using the file extension. Prefix the fileName with / (i.e. relative path) to look for the file on the internal SD card. For instance /myFile.pm3 will look for the file /mnt/sdcard/myFile.mp3. If fileName starts with file:/// you can specify a complete path to the file. Opens the Airplane / Flight Mode settings screen for the user. Thank you Samuel for being the sponsor of this method. Sets the current notification interruption filter. Possible values for filter are NONE, PRIORITY, ALARMS or ALL. Default is ALL. Usually you would toggle between ALARMS to enable the Do not Disturb mode (but alarms still will sound) and ALL to disable the Do not Disturb mode. Note: you will have to build the app before being able to use this method, because the companion app does not offer the permission android.permission.WRITE_SETTINGS. Also Notification Policy access is required to be able to use this method. Thank you Samuel for being the sponsor of this method. Event indicating that system write permission has not been granted. Tested successfully on Samsung Galaxy A5 (2017) running Android 8.0. Follow the opt-in URL to get access to the settings app and to be able to download it to your device. Follow the opt-in URL to get access to the ringtone app and to be able to download it to your device. It might take a few hours for Google to enable you as beta tester! 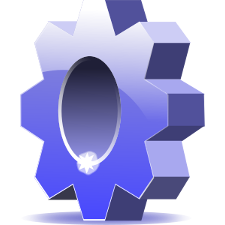 The free version works without write settings permissions and offers restricted functionality. See the documentation above about which blocks are available or not.